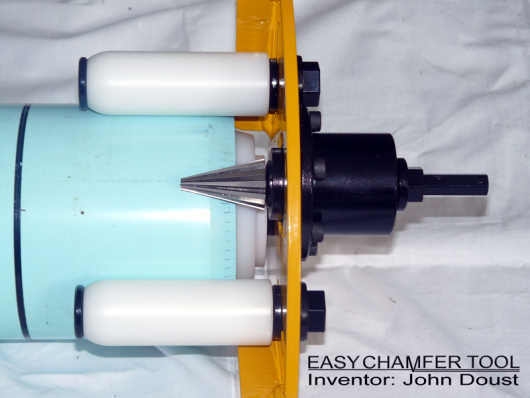 Easychamfer - A portable tool that can easily chamfer the cut ends of PVC pipes. The Easy Chamfer was developed to greatly reduce the time and labour it takes to chamfer PVC piping ranging from 90mm to 350mm (depending on wall thickness). This new tool chamfers precisely to the specifications of the manufacturers. The Easy Chamfer operates from a cordless or electric drill, or alternatively can be fitted with its own cordless or electric motor. Easychamfer -A close up of the tool. 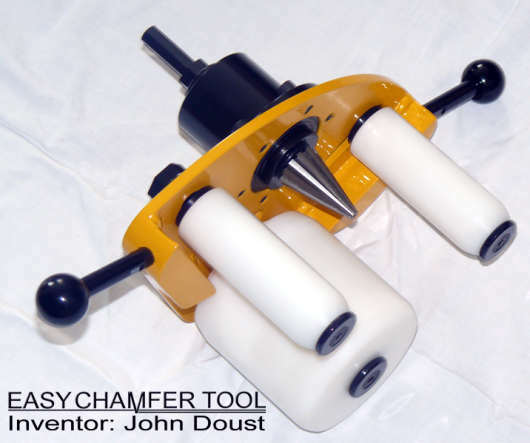 Easy Chamfer Tool showing the cutting tip and other components that make up this tool. Easychamfer - The tool set up for use in a cordless drill. Following two years of development and testing, I am satisfied that the product is ready to be released on the market. Demonstrations of the product to various trade experts including local suppliers, civil contractors and local government have also generated very positive responses and strong interest. "John Doust". 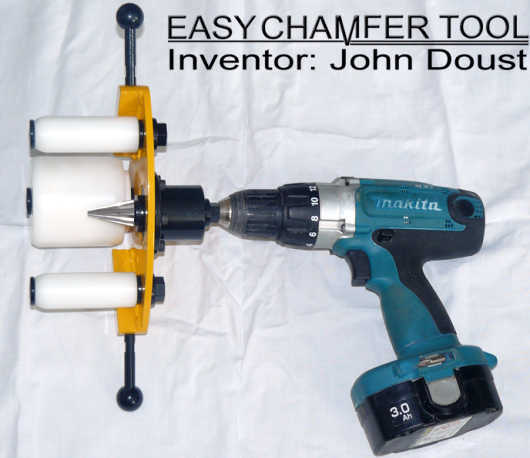 John Doust, the inventor of the Easychamfer has his own website and he can be contacted there. I am not a plumber, so I have not done an awful lot of work with PVC water and sewerage pipes but on the odd occasions where I have been giving a plumber a hand, or the more frequent times when we have put a backhoe bucket or an auger through a sewerage pipe I could have used one of these. Instead what we did usually was to get a small 100mm grinder and try to bevel or chamfer the end of cut pipes with it. We did this with varying amounts of success mainly because a grinder is not the right tool for the job. It grinds rather than cuts and leaves burrs that still have to be cleaned off. I really like the idea of being able to use an existing electric drill, which most of us already have rather than having to buy an all in one unit. If you are a plumber that works a lot with PVC pipes then I'd say have a look at one of these. From what I have seen it looks a well made tool that will stand up to hard knocks. Thinking about the times that I have damaged in-situ pipes, it would have been nice if the plumbing merchants that sold me short cut lengths had one of these. It would have been one less job to do on the site. Nice one John, best of luck with it. Here are a few new products that are related to building and home improvement type work. If you are an inventor and you are trying to get something that you feel is worth while off the ground then by all means contact me and I'll give you some space here to promote your product. If you have a website I'll give you a link, or if you have not got one yet then you can treat one of these pages as your info on the web. Hip Tite starter fitting for neater tile roofs. Elbow steel frames A no welding method of joining lightweight RHS. Power snips for fast scribing and straight cuts. Truss brace The Frook tempory truss brace and alingment tool for fixing pressed nail plate roof trusses. Arch Cutting Jig A simple and easy to use jig for cutting perfect arcs every time. Nobow Flooring Clamp A simple and easy to use jig for cutting perfect arcs every time. Note! The content and photos on these pages are copyright of each individual inventor. As such they cannot be used without permission. Just in case you have read a few of these pages and you think that my comments are a bit biased in favour of the inventions, well.... you are right. Why would I bother putting something here if I don't think it is any good? There are heaps of websites that promote crap for money if that's what you want.